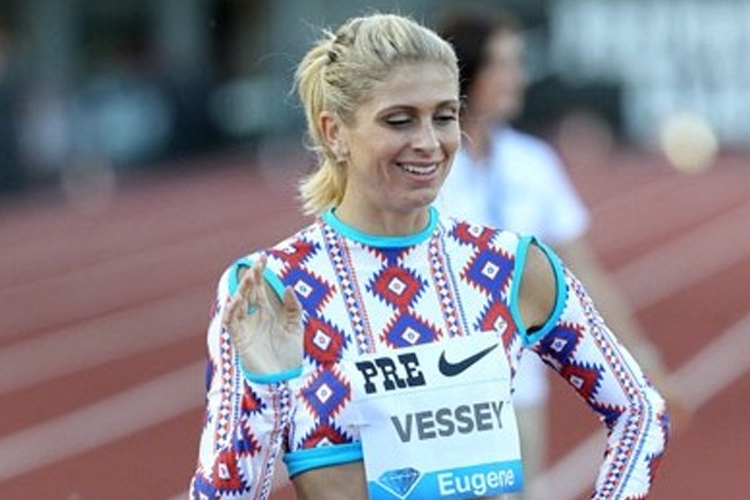 Maggie Vessey: A Stand Out On The Track. | LEADER OF THE TRACK. Maggie Vessey: A Stand Out On The Track. At Leader of the Track, we love runners who like to take a risk, especially when it comes to on point track apparel. Last Year, Runners World wrote a brilliant article on American, 800m runner, Maggie Vessey who decided to make her mark by not only proving herself as one of the track elite but also as a track style icon, teaming up with high fashion designer Merlin Castell (www.merlincastell.com) who has designed outfits for Paula Abdul, Priscilla Presley and Paris Hilton just to name a few. It’s great to see an athlete daring to be different and expressing their personality through their outfit on the track! More athletes should start taking more risks with their competition apparel and not be afraid to stand out! With the push for sublimated sports apparel, options for colours and design are endless when it comes to producing athletics apparel which stands out. The following article on Maggie Vessey was featured in the July Issue of Runners World in 2014. Story by Megan Hetzel. Elite track runner Maggie Vessey debuted personalized, eye-popping outfits at track meets throughout the year, transforming the oval into a high-speed runway. When her relationship with former backer New Balance ended in January, Vessey resolved to take advantage of her newly blank slate and build a brand that truly reflected her. Vessey says she’s always been interested in fashion, describing her aesthetic as elegant and regal with a dash of playful and fun. To make her vision a reality, Vessey partnered with Merlin Castell, a Los Angeles-based clothing designer. The process of producing each outfit — from sketch to the starting line — has typically taken only four or five days. So far, Vessey says the feedback she’s received has been, for the most part, encouraging. “Before the trials at USATF Championships, one of the girls pulled me aside and said, ‘I just want to thank you for what you’re doing for track and field,'” Vessey says. “It was such a beautiful moment because we were about to go compete, but yet she’s still felt inclined to say that to me. I was just overwhelmed with gratitude to know that what I was doing was being well-received by my competitors. Check out a rundown of the outfits she’s worn this season here. More designs are in the works for her fall races overseas. ← INTRODUCING PURE SPORTS HYDRATION!